We pulled in to our hotel in sioux falls after dark last night. It was a comfortable place but we did not have the time or energy to use the swimming pool and water slides before we crashed out. 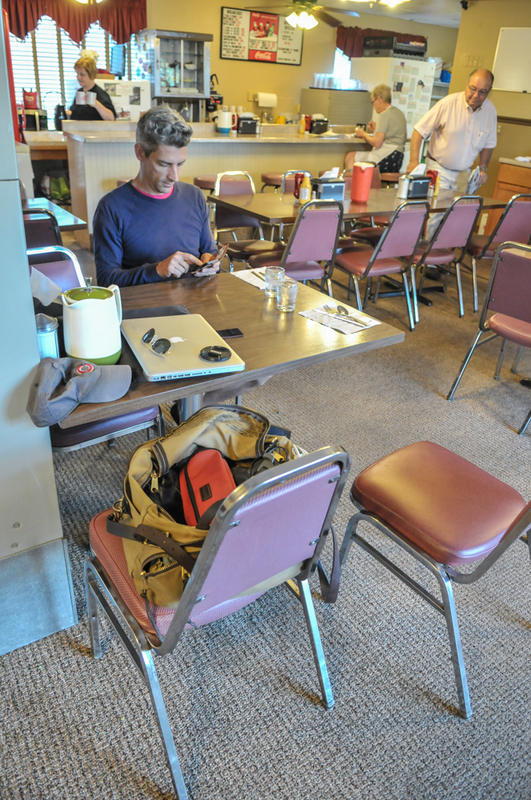 We pulled our rig out of the hotel lot and a short drive later we arrived at Rosy’s Dinner. Thankfully there was a large space on the street outside to dock the beast. 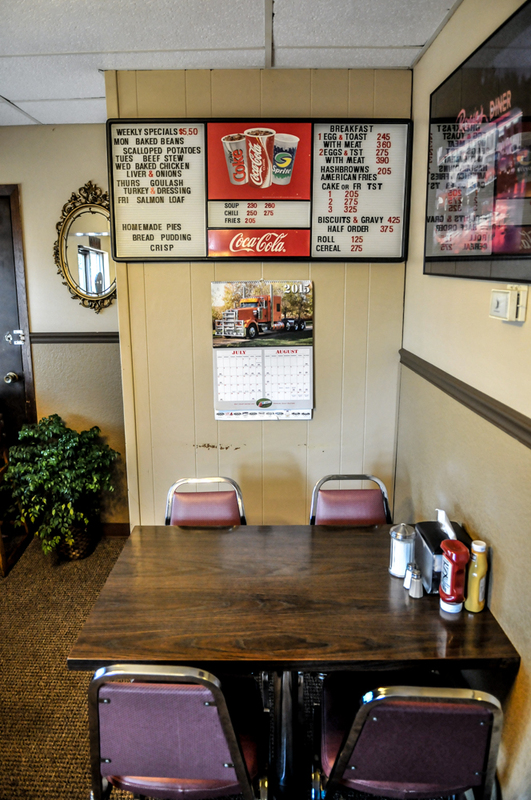 Rosy’s was a warm and welcoming ‘Mom and Pop’ place. We carefully selected our table. It was the kind of place which had a regular breakfast crowd and we did not want to take anyone’s table. As we ate our breakfast a couple of other tables filled up with people who were greeted by first name by the wait staff. A group of 5 or six retired gentlemen sat together in a way which suggested they had done this may times before. The chance to see small town America and patronise small businesses like this is one of the most appealing things about driving across America. Where ever possible I would always drive just a few minutes off the highway, away from the homogenised, neon clad chain stores and restaurants to find a locally own place. Even if the food is not great (and that does not happen very often) there is always a friendly face and a conversation if you would like one. Fully satisfied after our meal, we headed back out onto I-90 West to make our way across South Dakota to Wyoming. Today we would see Mount Rushmore and the Devils Tower. The scenery remained pretty much unchaged most of the morning with wide open corn covered plains punctuated by a farm house here or a herd of wind turbines there. It wasn’t until we had been travelling for a few hours that saw a dramatic change. The moment we crossed the Missouri River the green flats were exchanged with rolling hills and mountains dissected by our own undulating highway The contrast was dramatic and we knew were approaching The Bad Lands. 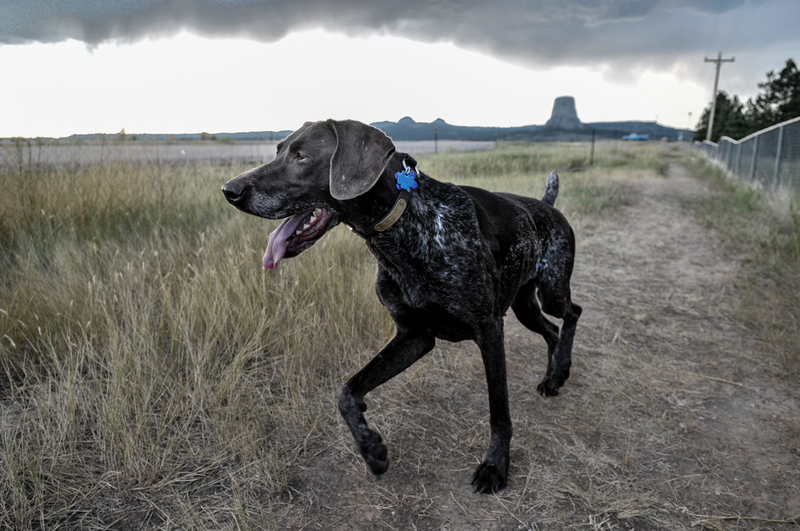 There were times that we were beginning to doubt whether or not or rig would actually make it up some of the long steady ascents but she pulled through and carried us, at an albeit sedentary pace, across South Dakota. 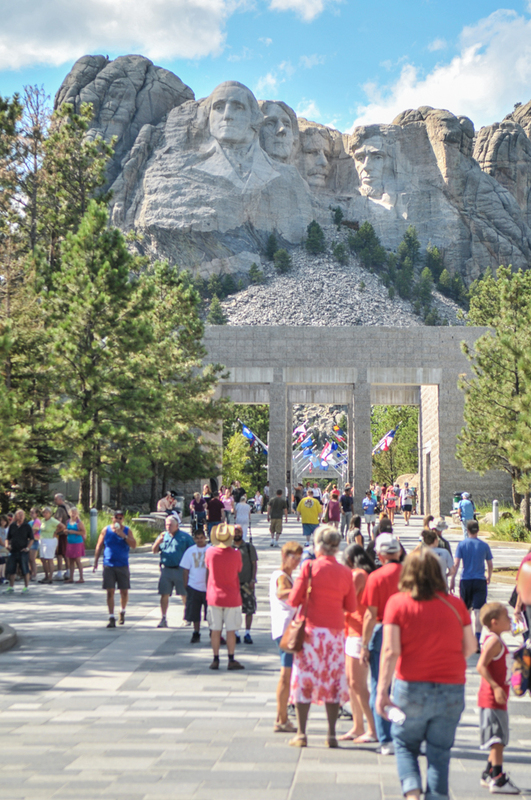 The closer we got to Mount Rushmore, the more dramatic the landscape became until we could see the Black Hills ahead of us. 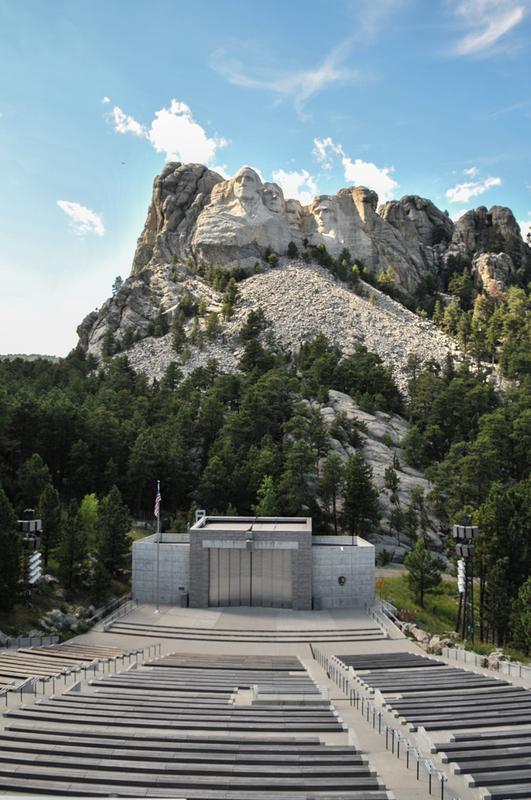 The road climbs quickly and winds through the wooded Black Hills and eventually the enormous stone carving creeps out from behind the trees. 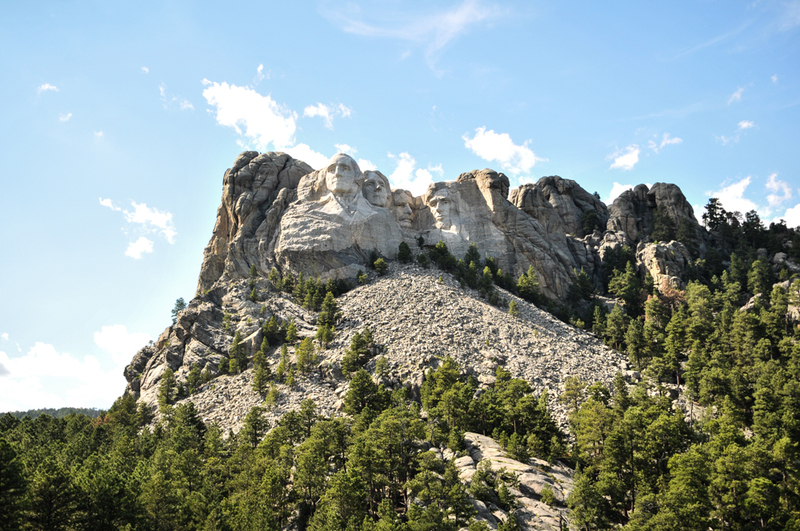 I have often heard, from those that have been there before, that Mount Rushmore is underwhelming. That it is a long way to go for not much return. I would like to dispute this. We had a pretty tough time getting our truck and trailer up into the mountains, so what should have been a 30 minute drive from the highway was over an hour, but it was well worth the effort. 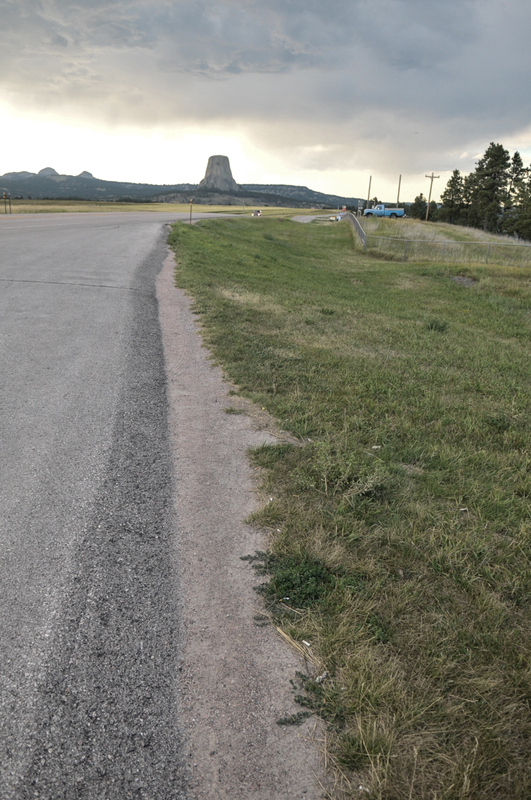 We left the monument and headed out to the state line towards the Devils Tower. The highway took us round the edge of the Black Hills and we were able to take in the scale of these mountains from afar but soon after we left them behind and crossed the vast green expanse of Wyoming. This is my first time in this state but already I can tell that I would like to come back. There are horses running in paddocks near the highway and giant rocky outcrops overlooking lush green valleys. Everywhere is so green that it is hard to believe that there could ever be snow here and certainly not enough snow to warrant the massive black snow fences which flank the highway in order to stop drifts blocking the road. I guess, like Mount Rushmore this is just another example of us trying to impose our will on nature. 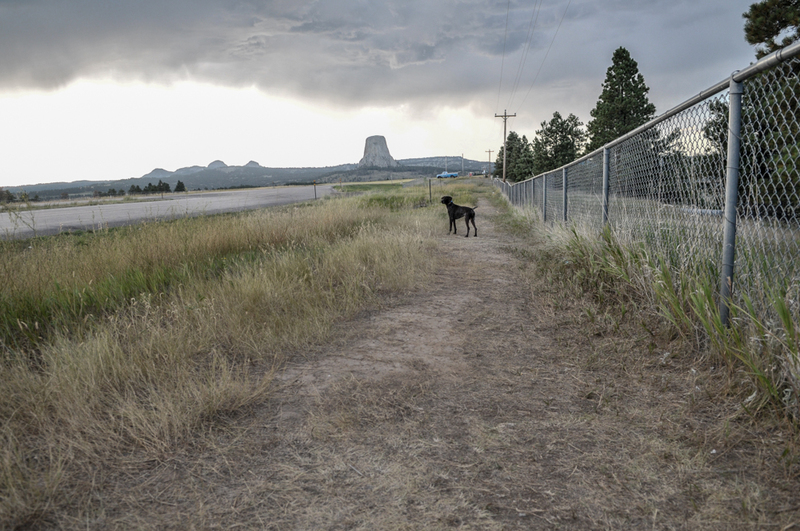 The sky actually seems bigger out here and as The Devil’s Tower appeared before us on the horizon we could actually see the weather front moving across the sky and the clouds emptying rain over the landscape off to our right. Fortunately it did not land on us. I wonder what the first settlers thought as they pioneered their way across the country and came upon the Devil’s Tower. It is no coincidence that it was used in the movie Close Encounters of the Third Kind as it looks imposing and other worldly. From there we headed back to the 90 and continued West through more green wide expanses interrupted only occasionally by mile long freight trains carrying coal away from an incongruous industrial mine and processing plant. Again I can’t help thinking that we aren’t always that kind to mother nature. I’m enjoying your travelogue and pictures…Thanks for doing this on line!